Restoration work has started on one of London’s most famous community murals after Camden Council, who commissioned the original painting in 1980, agreed to fund the project as part of its Tottenham Court Road revamp. A photographer is lifted to the top of the Fitzrovia Mural to make an exact record of the remaining original artwork at Whitfield Gardens, Tottenham Court Road. 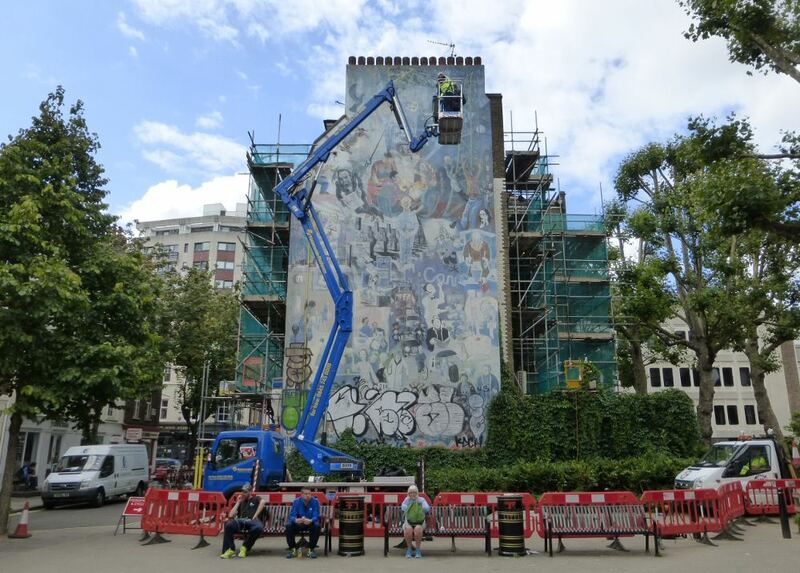 On Thursday a cherry picker was parked on the piazza at Whitfield Gardens to lift a photographer to the top of the Fitzrovia Mural to make a precise digital record of the remaining original paintwork. The plans to restore the mural — which has been partly covered in graffiti and in need of repair — were initially put forward by artist Kristina O’Donnell, the Fitzrovia Neighbourhood Association, and the London Mural Preservation Society in 2010, but failed to secure enough funding to start the project. Now O’Donnell, whose own father and uncle appear in the mural, is working with Eazl a creative production company and the Fitzrovia Community Centre with funding from Camden Council, to recreate the original work to return it to how it looked when it was first unveiled. The photographs of the mural in grid sections will be used to plan the restoration and the images will also put on a website together with a special exhibition to raise awareness of the project. “As part of the restoration campaign, we’re trying to identify and make contact with some of the characters in the picture. We’re appealing to anyone who has information about the people portrayed in the mural to contact us at mural@fitzroviacentre.org to help bring the story of the mural into 2015,” says Tulloch. A series of community meetings and events will be organised around the exhibition to help identify the characters within the picture, as well as encourage discussion and debate about the future of the mural amongst local residents, workers and businesses. The Fitzrovia Community Centre is taking responsibility for promoting the restoration project, as well as fundraising for a series of legacy projects. Camden Council is initiating the tendering process to find a suitable contractor to carry out the restoration work. 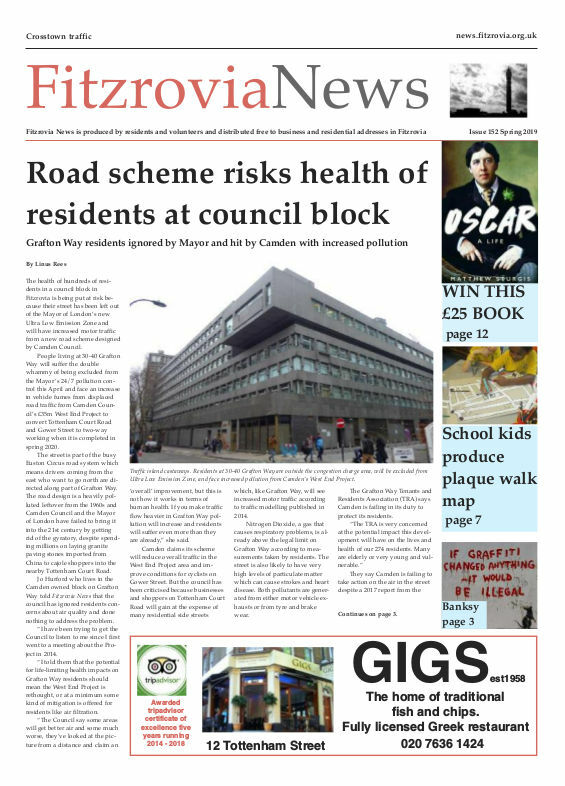 Councillor Abdul Hai, cabinet member for culture, customers and communities, told Fitzrovia News that “Camden has committed the funds needed to restore the mural as part of the wider £26 million scheme to regenerate the Tottenham Court Road area, linked to the arrival of Crossrail in 2018. The Fitzrovia Mural, originally painted by artists Mick Jones and Simon Barber, is a fascinating depiction of local life and Fitzrovian characters. Sadly, Mick Jones died in 2012. In 2010 he told Fitzrovia News about how they set about creating the mural. Jones said the mural addressed the wider themes affecting the area at the time.